Rarely do I come across something like this cauliflower tart. It sounds pretty innocent — boring even — but tastes like it knows something you don’t. It is Last-Meal-worthy, the sneaky show-stopper at brunch, the one dish that could convince you that vegetarianism might be tolerable. The kind of dish that makes a Tuesday night feel like a Friday and helps a bottle of wine go down like a glass. It’s no secret that cauliflower and cheese make a winning combination (see here). So you can only guess the result of roasting the cauliflower, mixing it with caramelized onions, covering it in various cheeses, cream and truffle oil, and baking it in a flaky tart shell spread with mustard until it’s golden and bubbling. This tart is ridiculously good and so simple. It’s also easily fiddled with. I used sour cream because I didn’t find mascarpone at the Russian market. The gruyere can be substituted with Swiss, Emmental, cheddar, or a combination. The truffle oil is unnecessary, but if you happen to be the sort of person who has it lying around (and yeah, I’m pretty sure you can sort people that way), why not? The whole crust thing can be left (/scraped) out all together (I’ve seen it happen! Hi, Helen! ), and your guests will be just as stunned by the deliciousness of the pile of perfection on their plates. Now that you know the secrets of the perfect cauliflower tart — a dash of Dijon and a lot of cheese — don’t say I didn’t warn you when she sweeps you off your feet. Innocence be damned. Make cauliflower: Preheat oven to 425°F/190°C. Toss cauliflower with a few glugs of olive oil, salt and pepper in large bowl. Spread on rimmed baking sheet, and roast 15 minutes before turning florets over and roasting until brown and tender, another 15 minutes in my oven. Reduce oven temperature to 350°F. Meanwhile, prepare the onions. Heat a glug of olive oil in a large skillet over low heat. Add onion, sprinkle with salt and pepper and cook until onion is a deep golden brown, stirring occasionally, about 30 minutes. Prepare the filling by whisking together the eggs, mascarpone (or sour cream), cream, nutmeg and stirring in the grated cheese. 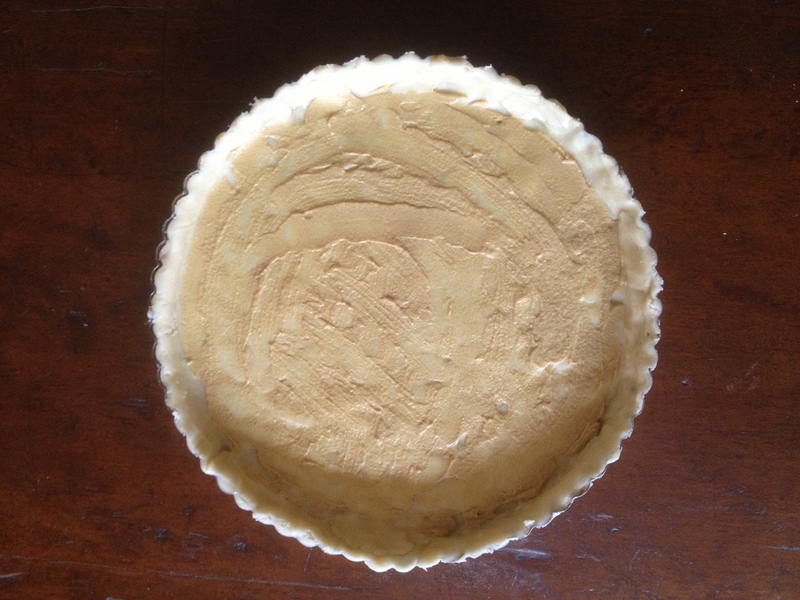 Prepare the tart: roll the dough out to fit a large tart pan with removable bottom. Press the dough into the pan. You may need to par-cook the crust, but I don’t think it’s necessary. Spread the bottom of the crust with mustard. Spread the caramelized onion over crust, then arrange cauliflower over the onion. 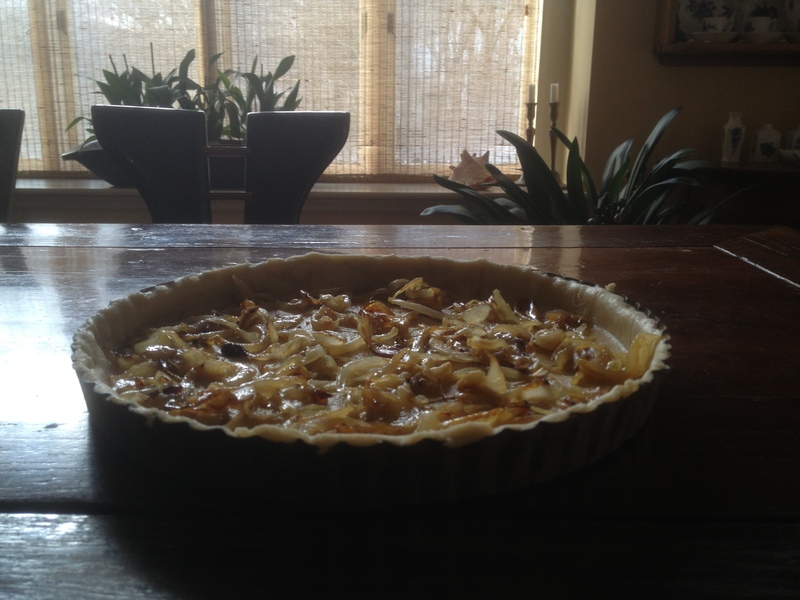 Set the tart on a rimmed baking sheet (in case of leaks). Pour the cheese mixture over filling in tart pan, sprinkle with more cheese if desired. Bake until tart is golden and center is set, about 40 minutes. Cool 15 minutes before serving. 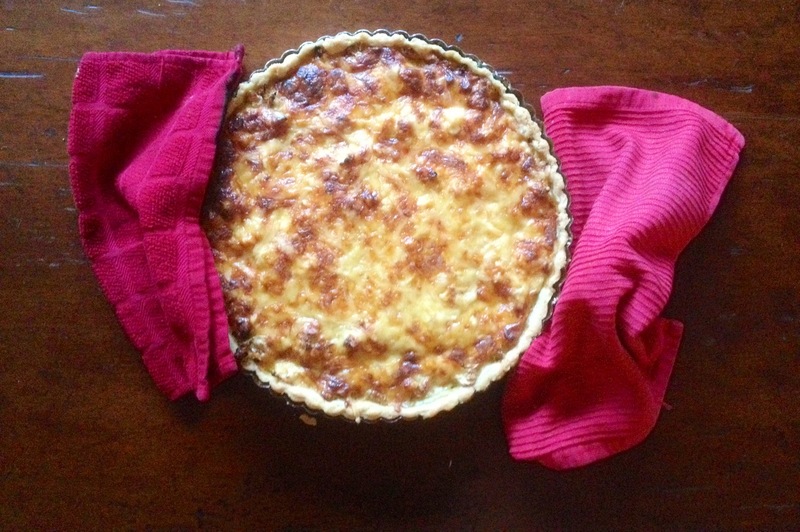 The tart (or its various components) can be made a day ahead and gently reheated before serving. It was cold last week and I was too lazy to go to the store to buy cream and mascarpone, so I made it with Greek yogurt and full-fat milk. It still tasted dreamy and decadent. And yes, I do have truffle oil lying around in my kitchen.